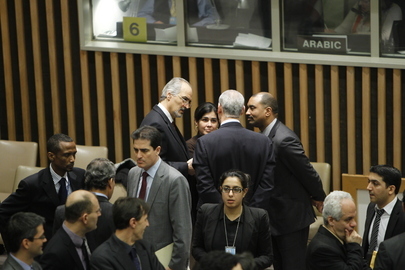 UNITED NATIONS, February 9 -- Amid buzz that Syria could soon be debated in the UN General Assembly, Inner City Press on Thursday asked the spokesperson for the GA about a report the debate would take place Friday. The spokesperson denied it, but barely an hour later at a reception for Iran's national day, the Permanent Representative most concerned told Inner City Press that "the Qatari, the President of the General Assembly, has already launched invitations to member states for a GA meeting on Monday." Inner City Press asked about the absence from Thursday afternoon's Security Council session of Permanent Five members' Permanent Representatives, which one Deputy told Inner City Press was a "PR level meeting on Syria." (Inner City Press reported this earlier on Thursday; a Council diplomat said it was particularly noteworthy that "UK Perm Rep Lyall Grant wasn't there for the Irish foreign minister" who spoke in the Council Thursday afternoon.) The answer was, it concerned Syria but not the General Assembly. Ironically, the Security Council ambassadors are scheduled to travel to Haiti, which would have them missing a General Assembly session on Monday or even the next two days, a sort of Second Syria Superbowl. Also at the Iranian reception, which featured Secretary General Ban Ki-moon's outgoing chief of staff Vijay Nambiar but not apparently Ban himself, a UN budget expert told Inner City Press that Ban has the flexibility to spend up to $8 million on an envoy or mission to Syria without seeking any approval. At Thursday's noon briefing, Inner City Press asked Ban's spokesman Martin Nesirky the most recent date on which Ban spoke with is previous envoy, to Libya, Jordanian politician and businessness Al Khatib. Nesirky said he would get the date, but nine hours later and counting it had not been provided. Watch this site.